There’s no doubt that being a professor is no easy feat, with even more work going on behind the scenes to create engaging learning experiences for students. Whether it’s gathering materials for the course or delivering the curriculum in the best way possible, the role of the instructor is all-encompassing, touching upon the roles of course-designer, manager, mentor, workshop facilitator, grader, presenter, advisor, and more. Nearly half of the professors (46% to be exact) surveyed identified student engagement as their number one challenge. From the feedback we received, a common difficulty that instructors have is keeping students interested and motivated, whether that means getting them to actively participate in discussions, read the text, or demonstrate a willingness to reflect and apply concepts to their own lives. While the ultimate goal is for students to be present in class and prepared to ask questions, the survey numbers show that there’s a long way to go, especially since student engagement is a concern that comes up again and again. 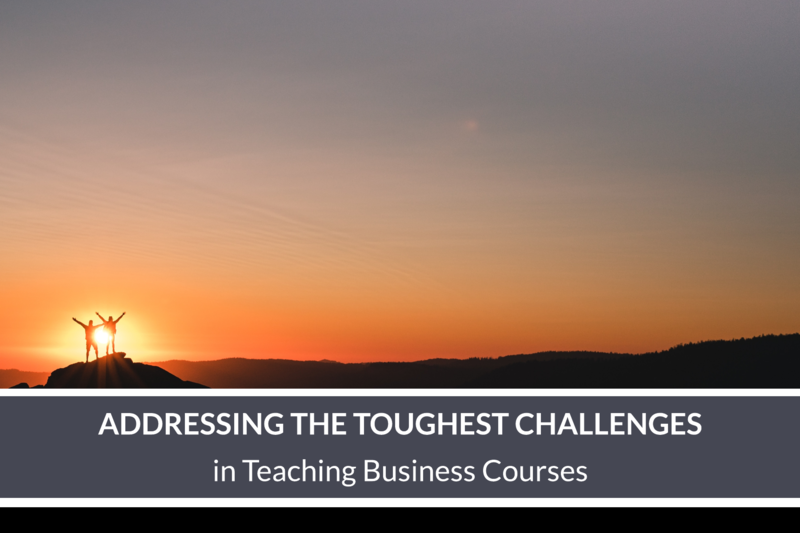 25% of those who responded to the survey identified relevance of course materials as the toughest challenge in teaching business courses. Professors explained that because traditional teaching materials and case studies are often outdated, a significant amount of time and effort is required to make lessons relevant and applicable outside of the classroom. 10% of those who responded to the survey identified course readiness and skills gaps as their toughest challenge. Descriptions of the issue identified a variety of problems from lacking professional writing and reading comprehension skills, to the challenges presented when the class itself is comprised of students with dramatically varied backgrounds and experience. When students’ skill levels, priorities, and interests span such a wide range in a single class, the goal of engaging them becomes that much more difficult. So, how do you turn disinterested students into engaged students and more long-term, the leaders of tomorrow? By going directly to the source—the course material. The course content is directly building the foundation of a student’s business skills: it prepares them to think, analyze, and take action in certain ways; more specifically, in the way that they are taught. Thus, if an outdated business case is teaching them to approach problems in one way, students will apply this principle to current cases, which will set them backwards, rather than set them up for success. An underlying theme of the top challenges that professors face is that due to a significant portion of the material being irrelevant, students aren’t engaged nor well-prepared. This is also exactly the reason why Real Time Cases offers real-time, video-based cases from modern companies. We understand the pain points of professors, and created a product that addresses exactly that. Learn more about how professors such as Barry O’Donnell are Energizing the Classroom with Real Time Cases. Then, read more about how our unique instructor-facing resource, the Case Study with Teaching Notes, offers comprehensive implementation support. 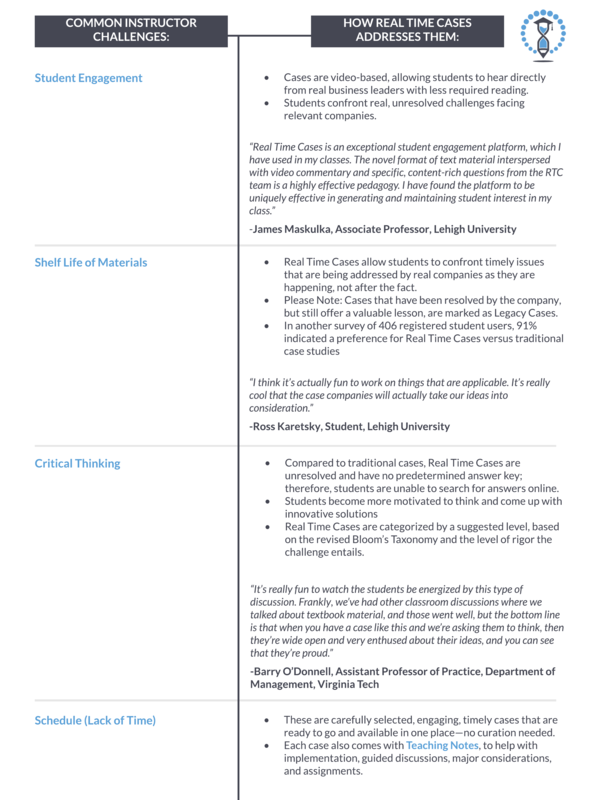 To learn more about how Real Time Cases can help you engage your students, book a 10-minute demo with one of our helpful representatives today.